Under-floor radiant heating is becoming increasingly popular. Pipes, often of a flexible plastic called PEX, are hidden in the subfloor system. Warm water running through them heats the flooring, which in turn heats the room. Because the surface area of a floor is so large relative to that of radiators, its temperature doesn’t have to be very high to heat the space. 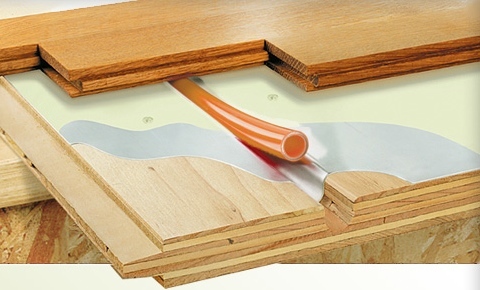 The PEX can be installed in a masonry mix poured on top of the subfloor, or it can be fastened to the subfloor from below (see the draw¬ing on the facing page). Sometimes, radiant heat is installed in masonry slabs, and wood flooring can be installed over it there as well. Extra care is necessary with the design and installation of both the heating system and the wood flooring. It’s crucial for the heating system designer to limit the maximum surface temperature of the subfloor to 85°F, as under-floor radiant heating can dry wood flooring excessively. Sharp temperature fluctuations should be avoided, as they dramatically exacerbate moisture fluctuations in the wood flooring, which in turn repeatedly changes dimension. These repeated dimension changes stress the fasteners and can eventually lead to squeaky floors and wide joints between the flooring boards. To limit these dimensional changes, design the radiant heating system to deliver gradual temperature changes. It should incorporate an outdoor thermostat that allows the radiant system to anticipate interior heating demands. This results in more gradual floor temperature variations in response to changes to the outside temperature. REMOVING EXISTING FLOOR COVERING. REMOVING OLD LINOLEUM OR VINYL FLOORS.